This fly first came to my notice in an article in the Total Fly Fishing magazine written by Chris Reeves. The component giving the fly its name is the recycled wire from the Taser gun used by the Metropolitan police. It takes very little practice to produce a lifelike and durable buzzer or nymph. With the addition of various colours of underbody it is possible to tie up a range of flies to match the hatch. I cannot wait to try the version with the peacock herl underbody and a gold bead head. 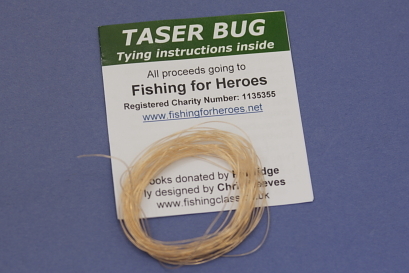 For as little as £2.50 you can get a pack of at least 2 meters and the proceeds go to the Charity “Fishing for Heroes”. This includes postage within the UK. Hook – Wet fly or Buzzer hooks sizes 10/12. Thread – 6/0 colour to suit. Tail – (optional) White baby wool or hackle fibres. Underbody – Tying thread, strand of coloured wool. coloured wires, lurex. Overbody – Tazer wire in touching turns. Thorax – Peacock herl, Sparton body Czech. Please visit the website www.fishingclass.co.uk for purchasing the Taser wire. Hello, I have been trying some of these flies and they are great! I am learning plenty fro your step by step method and it is very clear. One piece at a time and made simple how to do it. Thank you. I have not tried mine yet but I am about ready to get to the lake when the bite is on. I have just taken up Fly tying last month and found your videos and website. Your videos are very well done and easy to follow even real time on the bench. Keep up the good work and may you continue making fly tying easy for a long time to come. Beauty fly! I really appreciate that you make use of “ordinary wool”. I use wool knitting yarn for Elk Hair caddis, and it works wonderfully. I can get a skein for $4, and will not run out for a year! Your use of everyday materials is fantastic. I even use feathers that I find around the ponds! Glad to see you are back in action. Bout bloody time Mr Cammiss!! Seriously, delighted you have put last year behind you. I’m sure its good to be doing stuff again – definitely good to see your inspirational tying. thanks for your e-mail. Last year is best forgotten( with some difficulty). There is another vid in the pot and will be out soon. I have been checking your web page for several months, hoping there would be a new posting. I began to wonder if you where ok. Thank you for another nice fly. Good to see you back in action. I have enjoyed all of your lessons from “across the pond” but of late I became worried that you were done giving us the benefit of your vast knowledge. I am glad to see you happy, healthy and still tying. 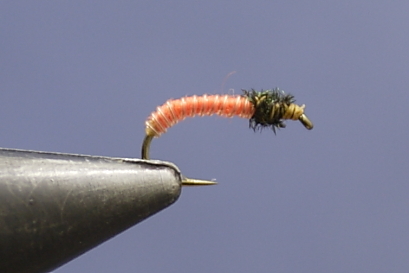 How about tying us a traditional winged wet fly? I have always had problems getting the wings right.